The British-built SUV, which moved into its second generation earlier this year, achieved significantly higher ratings for adult and child occupant protection than the original model received in 2011, even against a tougher testing regime. 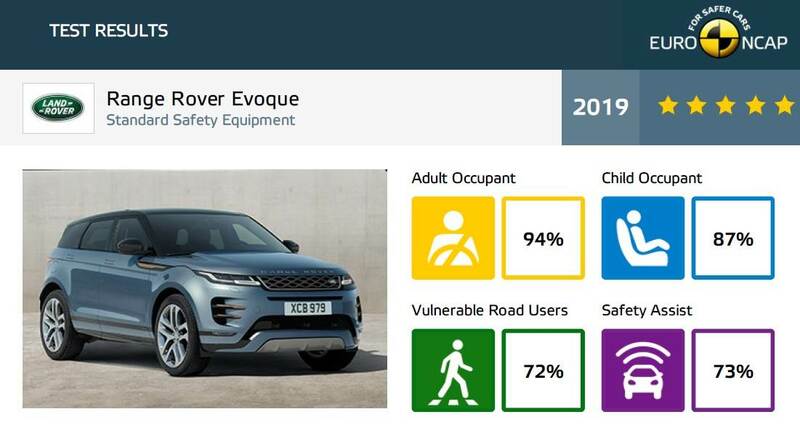 An adult protection rating of 94 percent and a child protection rating of 87 percent make the new Evoque the safest Land Rover ever tested by Euro NCAP. A pedestrian protection rating of 72 percent is also strong, as is a safety assist technology rating of 73 percent. The automatic emergency braking system scored maximum points in tests of its functionality at city speeds. Alongside the Evoque, Euro NCAP tested the new Citroën C5 Aircross. The Seat Ateca-rivalling SUV scored four stars for entry-level European spec models, but all UK cars receive the maximum score as they are fitted as standard with the Safety Plus Pack, which adds a radar sensor to the existing front-facing camera to improve the performance of the automatic braking system and enable detection of cyclists.